Prominent peace activist Anne Montgomery, RSCJ, died Monday, August 27 at Oakwood, the Society of the Sacred Heart’s elder care center in Atherton, California. Known around the world for her commitment to peace, Sister Montgomery was incarcerated many times after witnessing to peace and justice through acts of nonviolent civil disobedience, in protest of nuclear weapons. Her life will be celebrated in a Mass of Resurrection at Oakwood on a date yet to be determined. “Contemplative and a lover of the poor, Anne stood simply and strongly against that which harmed people and the earth, regardless of the cost to herself,” wrote Fran Tobin, a Religious of the Sacred Heart and one of her many friends. Anne Montgomery was born in San Diego, November 30, 1926 to Rear Admiral Alfred E. and Alice Smith Montgomery. Her only sibling, a brother, Brook, predeceased her. She entered the Society of the Sacred Heart in Albany in 1948, professed first vows in 1951 and final vows in 1956 in Rome. She is remembered with deep respect and affection by Religious of the Sacred Heart around the world, as well as former students and colleagues. As a member of a Navy family that moved several times during her childhood, Sister Montgomery found a home as a teenager at the Eden Hall Academy of the Sacred Heart in Torresdale, Penn. She graduated with both a bachelor’s and master’s degree from Manhattanville College, also founded by the Society of the Sacred Heart, and later earned a second master’s degree from Columbia University in New York. Sister Montgomery’s teaching ministry began in classrooms in various Sacred Heart schools, including the Convent of the Sacred Heart in New York City, where she served 1959-69. In 1970, she began to teach at the Street Academy of Albany, where she experienced the challenges faced by the poor and people of color. In 1975, after training to educate children with learning disabilities, she returned to New York City to work with school dropouts in East Harlem. In the late 1970s, Sister Montgomery began the work of her life – that of peace and service to the most vulnerable – first at the Catholic Worker House in New York, then with the Little Sisters of the Assumption in East Harlem. She soon moved into a fulltime ministry as an advocate for peace, which was to continue for the rest of her life. She became known in the peace communities on both the East and West Coasts as a person deeply committed to nuclear disarmament by nonviolent actions. In 1980, as a member of the first Plowshares action called The Plowshares Eight, Sister Montgomery took what was to be the first of several Plowshares disarmament actions. She was arrested and served time in jail several times. 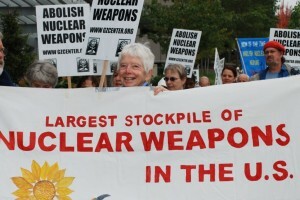 Her final Plowshares action took place in 2009, when she was 83. She served her two-month jail term, and four months of house arrest, last year. Sister Montgomery’s commitment to peace and nonviolence led her to ministries in war-torn areas around the world. As a member of the Christian Peacemaker Teams, an ecumenical anti-war nonviolent group, she served as a witness to peace in the 1990s in dangerous conditions in Iraq, the West Bank, Hebron and the Balkans. Sister Montgomery was also a member of Pax Christi and the Catholic Worker Movement. She received several awards for her work for peace, most recently the 2012 Courage of Conscience Award from the Peace Abbey in Sherborn, Massachusetts, which she received just one week before her death. She was a sought-after speaker and an educator both by example and word, but her true call was to stand as witness to the Gospel. Sr. Anne Montgomery is a legend in some peace movement circles. 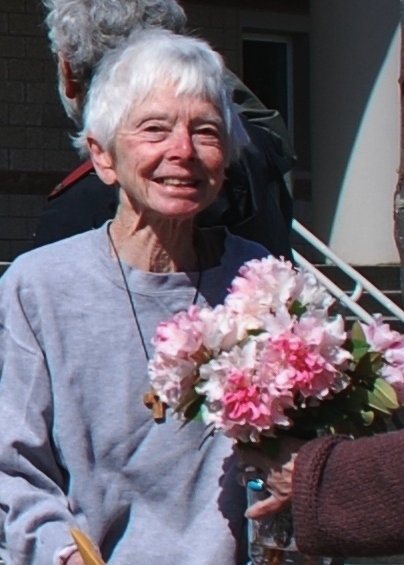 A member of the Religious of the Sacred Heart, she has spent more than three years in prison for many civil disobedience actions against war, including seven Plowshares disarmament actions*; many years teaching in Harlem; and many years living with the Christian Peacemaker Team in Hebron, Palestine-Israel. I first heard her speak to a packed church in Reading, Penn., in 1982 about her part in the Plowshares Eight and vividly recall my shock at her gentle proposal that some of us need to go to prison and offer our lives to stop the killings, abolish nuclear weapons and save the planet. I thought then that she was the first authentic Christian I had ever met. Recently diagnosed with advanced cancer, she spoke with me on the phone the other day from her community in the Bay Area. John Dear: What led you to work full time for disarmament, justice and peace? Montgomery: In the 1970s, I was working with students in Albany and Harlem. My awareness came from people who were poor and knew the government wasn’t there for them. Eighteen-year-olds had just gotten the right to vote but didn’t use it because they felt it was useless. I also read Jim Douglass’ book Resistance and Contemplation, which helped me to understand the issue of nuclear weapons from a spiritual perspective, that nuclear weapons were evil and were the greatest reality and symbol of what was wrong. Then I heard Daniel Berrigan speak on the need to witness to the Gospel. The combination of my work with the poor, reading Jim Douglass and meeting Dan Berrigan challenged me to join the demonstrations and get involved. In 1980, you joined Daniel and Philip Berrigan in the Plowshares Eight disarmament action in King of Prussia, Penn. What was that first action like? I remember joining a demonstration in Washington, D.C., and risking arrest and learning from Jonah House in their sessions on civil resistance that we need to join a community of people who were interested in doing something, getting to know each other and planning an action together. We did a “die-in” at the Pentagon, and I was jailed for one night. Then I was invited to join the Plowshares group. Molly Rush was the only other woman in the group. I went on a retreat, said yes and did the action. It turned out that it was easy to get inside the General Electric Plant. I helped distract the guard then went inside, and there they were — the nuclear nose cones. We were able to hammer on a nuclear nose cone to symbolize the need for nuclear disarmament. We used the Isaiah quote as the basis for our witness: “They shall beat their swords into plowshares, and study war no more.” We said people should start dismantling these weapons. It was a symbolic action, but it was also real because we made those nose cones unusable. I spent 11 weeks in jail. Molly and I were separated because they didn’t have a women’s jail in that area. Because we were separated from each other and the men, we were asked to come out to help organize the support work and prepare for trial. In all these actions, the Holy Spirit is with us in a very real way. People are able to enter places and witness the evil that’s there in a way that’s unexpected. Doors open, people look the other way, and you’re able to get where you want to go. Even if we are willing to try and fail, the effort is in right direction. Tell me about your other Plowshares actions and what you learned for this nonviolent resistance to nuclear weapons. In July 1982, the Trident Nein group went to the General Dynamics Electric Boat shipyard in Groton, Conn. Four of us got into a canoe and boarded the Trident USS Florida and hammered on several missile hatches. Five of us went to the storage yard and hammered on two Trident sonar spheres. We waited there three hours before we were arrested. We always take responsibility for what we have done. It’s interesting that later, women in prison always understand our actions because of their familiarity with injustice, but they never understand why we wait to be arrested. We take responsibility. Certainly, the Plowshares Eight action stands out because it set in motion a whole movement, but the Thames River Plowshares also stands out because of the sense of vulnerability I felt in the face of our nation’s addiction to power and greed, in the face of such blasphemous power. On Labor Day 1989, we swam in freezing water for an hour and a half in the Thames River in Connecticut to reach the Trident nuclear sub, which was being readied for sea trials. Three boarded it from a canoe; those of us who were swimming got caught in the tide. Some reached the side and hammered on it. I’ll never forget the vulnerability of that swim in the face of the most powerful and deadly weapon on earth. If we want to change hearts and minds we have to come from that position of vulnerability and trust in God. What was your time in prison like? After the Plowshares Eight, I wasn’t afraid of the women in prison, that they might think we were crazy. I always noticed that the women immediately offer you something and ask you want you need. They’re very welcoming. That was a big relief and a wonderful experience. There wasn’t any violence usually. The women support one another, and they hunger for something spiritual. So we always started prayer groups and Scripture study groups, and the women liked that. That was always positive. But you become very aware of the injustice poor women suffer. Tell me about your most recent Plowshares action. 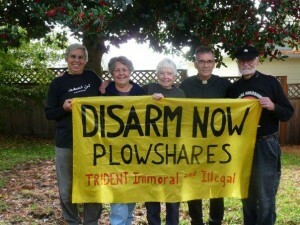 In November, 2009, five of us, the Disarm Now Plowshares, entered onto the Bangor, Wash., Trident base, cut through a fence, walked for four hours without being stopped or questioned, and cut through the last two fences where over 24 percent of all US nuclear weapons are stored in large bunkers that look like little cement huts. Our goal was to reach them. I wanted to be vulnerable in the face of these weapons. Later, the government tried to cover up that we got that far, that we faced those bunkers. They knew we were nonviolent, that we were nonviolent demonstrators. Each of us was treated differently. I was given two months in prison in Seattle and four months under house arrest. You have traveled many of the world’s war zones, and went to Iraq at least 15 times since 1990. I go to love our enemies, but I actually don’t consider them enemies because of the great hospitality the people of Iraq show us. I was with the Gulf Peace Team in 1990, just before the first Gulf War. We were a diverse international group in the desert on the border of Saudi Arabia, and we were there when the war began in 1991. It was a very vulnerable place to be, and we heard the bomber planes go over us that first night, and later saw the devastation caused by the war, the bombing of Iraq’s infrastructure and the sanctions. The presence of internationals who opposed the war was welcomed by the people. It was appreciated. I went again after the 2003 Gulf War began, and I learned again that our wars are not about freedom but oil and global, political control. Tell me about your years in Hebron, Israel-Palestine, with the Christian Peacemaker Team. I had participated on a peace walk in Palestine, and was looking for some way to work for peace. Then I discovered CPT (Christian Peacemaker Teams). They are faith-based, ecumenical and community-oriented, and maintain a peace presence in each place, such as Palestine and Colombia, over many years. We stayed there and were consistent. You get to know the people, what they are suffering and how they feel about the U.S.
Where is God for you in this journey and work for peace? I couldn’t do this work without faith in God. Two quotations are dear to me: First, from Isaiah 2: “They shall beat their swords into plowshares and study war no more.” The other is from Ezekiel: “Hearts of stone have to turn into hearts of flesh.” I’ve come to believe through prayer and Bible study about God’s presence in the heart of the earth. People need to change their hearts before they can change anything else. God is love, but unless we can love each other, we can’t know God. We can learn about ourselves and our own hearts of stone as we reach out in love toward others. Even though things don’t change right away, and we’re not immediately effective, it does happen. It just takes time. Change has to come from ordinary, vulnerable people at the bottom, because the power structure is not going to do it. Just before he died, Phil Berrigan wrote in his last public letter on the need to “embrace our powerlessness.” As we do, we become agents for the power of God to work among us. So we have to deny the self, take up the cross and follow. I recall, too, how St. Paul wrote about the Spirit groaning within the earth. That spirit gives us power and prays through us. That means a lot to me right now. Even when I feel I can’t pray, all I have to do is be aware of the Spirit and try to let it lead me. What are you learning these days as you face cancer? I’m learning more about powerlessness. I’m learning to let go, to be detached. I’ve been upheld by our elderly sisters who pray for me and support me, and that power of prayer is very real to me. I feel it. So I’m learning again that God does the work, not us. What advice do you have for those who care about peace, justice, nonviolence and disarmament? I remember Liz McAlister saying once, “Whatever issue you work on is connected to all the other issues.” That means we have to go deep into the heart of our issue. Also, people should try to join or form a community for this work of justice and peace. We want the world to become a community, and it’s hard, so we have to try to do that ourselves. And we want to form a community conscience that can take a stand on these critical issues. We need other people to help us. With others, we can reflect together on how to resist, and take action that comes from a place of prayer and faith and depth. What gives me hope are the ordinary people who get involved, who take one step out of their comfort zone and join the work for peace, such as the many people in the streets right now with the Occupy movement. We’re all learning that when we powerless people come together, we have power. I also have hope in knowing that God’s power and God’s nonviolence are stronger than violence and war. Love is stronger than evil, hate, fear or war. The opposite of love is fear, and the government tries to keep us in permanent fear. But when we come together in love and struggle for peace, we are no longer afraid and we can change things. As we trust each other and God, our fear lessens. So we can’t be afraid to do the right thing. Love is always stronger, and that gives me hope. * The original version of this column said Montgomery was involved in seven Plowshares anti-nuclear disarmament actions, which is incorrect. On August 27, 2012, God called Sr. Anne Montgomery, RSCJ, 85, home to her eternal reward after a long struggle with cancer. All who knew her lost a very special friend. The church has lost one of Jesus’ most steadfast disciples and prophets. And the world has lost an extraordinary peacemaker. Anne’s life story is truly a remarkable journey of faith. The daughter of an admiral, she joined the Society of the Sacred Heart of Jesus at 22. She graduated with both a bachelor’s and master’s degree from Manhattanville College, and later earned a second master’s degree from Columbia University in New York. She began to teach at the Street Academy of Albany, where she experienced the challenges faced by the poor and people of color. In 1975, after training to educate children with learning disabilities, she returned to New York City to work with school dropouts in East Harlem. It was during this time that she also became involved with the Catholic Worker. 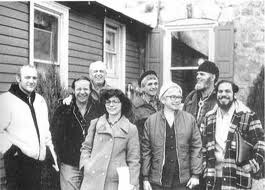 In 1980 Anne participated in the first plowshares action known as the Plowshares Eight. 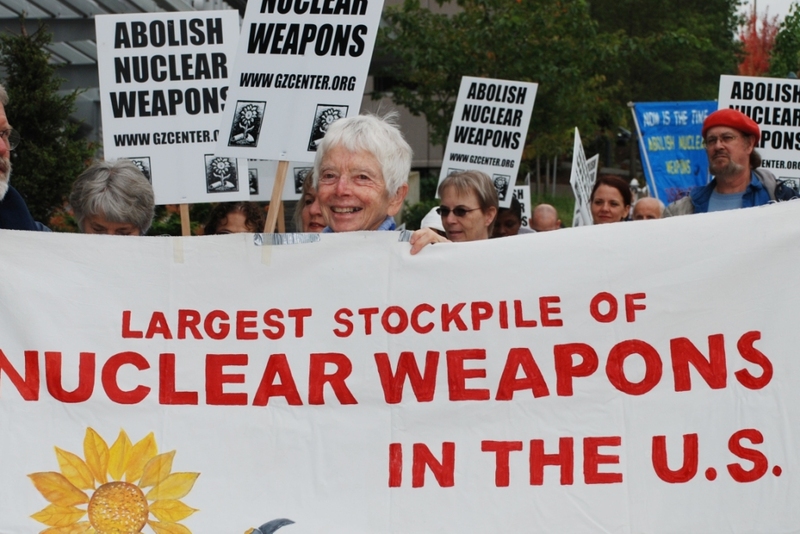 This unprecedented peace witness calling for the abolition of nuclear weapons marked the beginning of a new series of actions in which nonviolent resisters sought to enact the biblical prophecy of beating swords into plowshares. They would enter weapons facilities and military bases, and – using hammers, blood and other symbols – carry out a direct act of disarmament. There have been over 95 such actions to date. Anne would go on to do seven other plowshares actions, including two that I was also part of, and the last of which – the Disarm Now Plowshares – took place in 2009 when she was 83. She served over three years in prison for these acts of witness. She was among those activists who held a month-long liquids-only fast in 2000 aimed at ending U.S. support for U.N. sanctions against Iraq. According to UNICEF and other human rights groups, the sanctions were responsible for the deaths of a million Iraqi’s, including 500,000 children. Explaining her witness in the West Bank, Anne said in an interview, “We say we’re on the side of the people who have the biggest guns pointed at them. In this case, we think the (Israeli) occupation is wrong. It’s wrong to take people’s land, to destroy their homes, which is what the Israeli military does. As long as this unjust occupation continues, there can’t be peace.” (From an article posted on the Society of the Sacred Heart web site). I have been on chemotherapy for cancer, and it seemed to be helping, but, last weekend I had breathing problems and tests showed a lung full of fluid and that continuing any chemo, etc. would not help. I have been blessed by so much support, personal, and medical, that I know I must share that in some way with all those across our world who lack so much and are near desperation, especially for their children. I also know that the Spirit prays at the heart of the universe and that creation is an ongoing journey of death and resurrection, however mysterious that process is. Because it is energized by Love, we can enter into it rather than count on our own weak efforts and vulnerabilities and worry about failures. When I made my final vows, our group was named, “Joy in the Faith,” I am coming to believe that must somehow be possible since it is promised in the Beatitudes and that those who have nothing show us the way.I am constantly filled with gratitude to you all who have done the nitty-gritty work of peace and nonviolent action and invited me to join you. I hope to be able to do so in a new way. As Phil Berrigan said in his last letter, that work must come from our own vulnerability. I thank God for Anne’s inspiring life and for all she did to make the Word flesh! She was indeed a “doer of the Word!” Anne knew something about the cross as she stood with the crucified in war zones and spent long periods of time as prisoner. And she knew, too, something about the resurrection, as her faith was rooted in the hope that Jesus has forever overcome the forces of sin and death by His cross and rising from the dead. She exuded a joy that emanated from her love for life and God’s creation. Her life is a testament to the Gospel truth that love casts out fear and that with God all things are possible! Her unwavering commitment to nonviolence, accompanying and interceding for the victims, engaging in nonviolent resistance to systemic violence, and working with people from all over the world to create the beloved community will serve as a constant reminder of what it means to be a Gospel peacemaker. As one of many who loved and admired her, I will always treasure what I learned from Anne’s exemplary life. Thank you Anne for those of us who had the privilege to be your companion in “the nitty gritty work of peace and nonviolent action.” Thank you for your gentleness, wisdom, sense of humor, encouragement, humility, faithfulness and courage. Thank you for the gift of your friendship and for being such a beacon of light, love and hope for our world!!! Your spirit of love will forever live on in the hearts of all those you touched. We now pray for your intercession as we strive to do as you did: to abolish all weapons, end war and to make God’s reign of justice and peace a reality.